Teatro ZinZanni’s new home in Woodinville allows the dinner-show-circus spectacle to bring together all its operations and to consider longer-term, year-round ventures. A ZinZanni restaurant, anyone? Roughly a year after Teatro ZinZanni had to leave its longtime home on Lower Queen Anne, and six months after setting up a temporary location at Marymoor Park in Redmond, the long-running dinner-show-circus spectacle has found a long-term home: the site of the former Redhook Brewery in Woodinville. Teatro ZinZanni is in the process of signing a 10-year lease, with two 10-year options to renew, with the owners of the former Redhook property, said Norm Langill, founder and artistic director of Teatro ZinZanni. Its first show at this new location is planned to start in November, running through April 2019. Chef Jason Wilson, of The Lakehouse and Miller’s Guild, will be back with a new menu. The move allows ZinZanni to bring together in one place all its operations, from the huge, colorful spiegeltent where the shows are held, to its wardrobe and prop shops and administrative offices, which are currently scattered around the Greater Seattle area, from SeaTac to the Interbay neighborhood. It also allows ZinZanni to think about creating longer-term, year-round ventures. In its new home, the spiegeltent will be pitched in the meadow of the former Redhook Brewery site. ZinZanni’s wardrobe and prop shops, large costume collection and offices will be housed in part of the former brewery building. Also in that building will be a studio — complete with 35-foot-high ceilings to accommodate aerial work — in which ZinZanni performers can rehearse, create new work and offer classes to the public on acrobatics, gymnastics and juggling. ZinZanni offered such classes at its Lower Queen Anne location but “it was too difficult to include it in Marymoor,” Langill said. ZinZanni is also exploring opening a restaurant in the building that used to house the former Forecasters Pub. 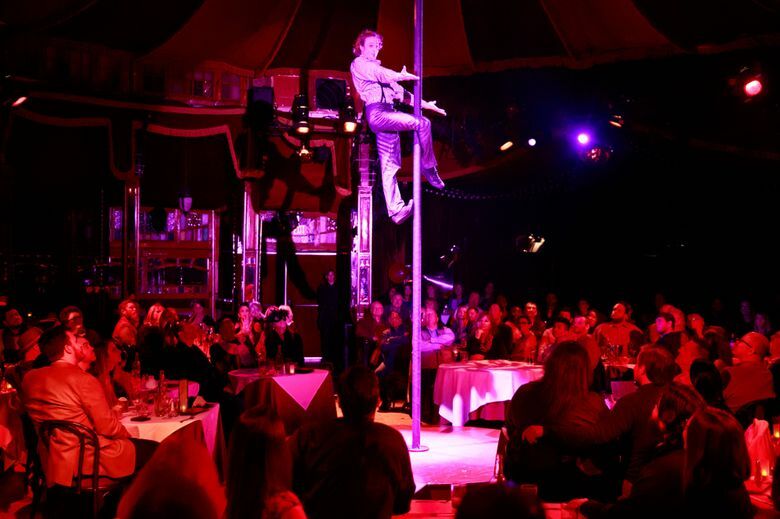 ZinZanni had been searching for a new home since early last year, when its lease in Lower Queen Anne, where ZinZanni had pitched its spiegeltent since 2010, expired and its landlord, Seattle Opera, decided to sell the land to a real-estate development company. Last October, ZinZanni set up a temporary location in Redmond’s Marymoor Park for a run of its “Love, Chaos, and Dinner” show. Langill declined to give attendance figures for that run but said “we hit our budget and the numbers we were hoping to get.” The company had said earlier that tickets purchased by Eastsiders nearly doubled as a percentage of overall attendance to about 35 percent, while those purchased by Seattleites dipped only slightly. The Marymoor Park run, which ends April 29, allowed ZinZanni to see that the show could succeed on the Eastside. The biggest realization for Langill, he said, was that during evening rush hour, it often took him less time to get from his home on Queen Anne to Redmond than it did to get from his home to downtown Seattle. “After 45 years of being here, I never realized the outflow from the city in the rush hour is so much more manageable than trying to come into the city during that time,” he said. The owners of Redhook Brewery, meanwhile, had decided last year to shut down the underused brewery to focus on a new Capitol Hill brewpub. 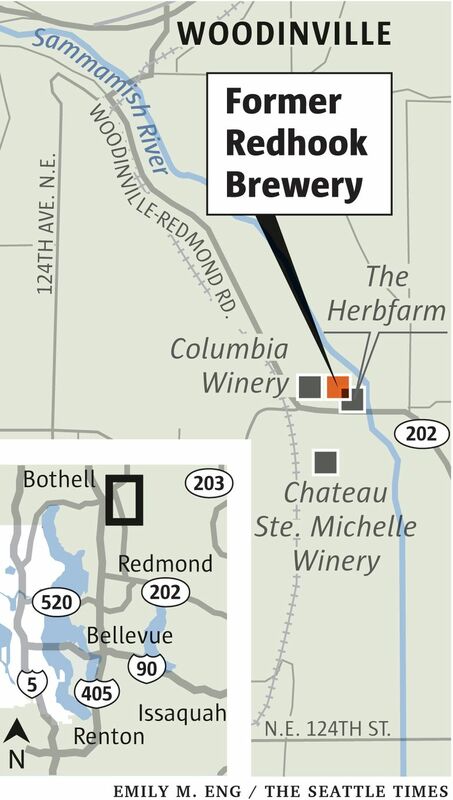 The property — a 20-acre site that sits in Woodinville’s tourist district near several wineries including Chateau Ste. Michelle and popular restaurants such as The Herbfarm — was sold for $24.5 million to Sound Commercial Investment Holdings, a Washington-based real-estate holding company. That deal closed in January. As it turned out, Dave Yuchasz, managing partner of Sound Commercial, had also been a longtime landlord of ZinZanni’s administrative offices in Interbay. In addition to its new Woodinville home, there are plans for more ZinZanni locations. A second one is planned, as part of a proposed hotel complex, in San Francisco’s Embarcadero waterfront. ZinZanni is also in discussions for two more locations, one of those somewhere in the Pacific Northwest.